KANSAS CITY, KS. — Kansas University Jayhawks basketball coach Bill Self was the keynote speaker at the 2nd annual Roos Basketball Tip-Off Dinner on Sept. 30. The event was hosted by the UMKC men’s basketball program and took place at the College Basketball Experience, next to the Sprint Center in downtown Kansas City. Source: University News. Photo shows Jayhawks coach Bill Self from a 2013 interview with Fox Sports. UMKC’s men’s basketball Head Coach Kareem Richardson spoke about this year’s goals and expectations, and introduced the 2014-15 roster along with the team captains. Attendees will have the opportunity to meet the team. Following the dinner, those with VIP access had the opportunity to meet and talk to both Richardson and Self. 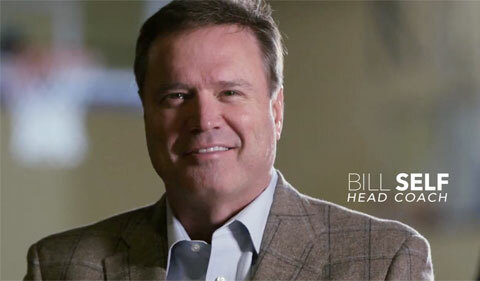 Watch Bill Self speaking with Reid Forgravein Nov. 2013 about the season outlook. Auction items for the event included a 2014 Sporting Kansas City jersey autographed by the team, a signed 2012 Team USA basketball, a trip to Brazil with UMKC’s men’s basketball team and staff and a WAC Tournament and Golf Experience in Las Vegas. UMKC men’s basketball will play an exhibition game against Rockhurst University on Saturday, November 8 at Municipal Auditorium, followed by exhibition games against the Missouri Tigers and the Kansas State Wildcats. Self has led Kansas to ten straight Big 12 Conference regular season championships and the 2008 NCAA national championship. He is one of three active coaches who have led three different teams to the Elite Eight of the NCAA Tournament (Rick Pitino of Louisville and John Calipari of Kentucky are the others). During his first few seasons at Kansas, Self persuaded several McDonald’s All-Americans to become Jayhawks, including Mario Chalmers, Darrell Arthur, Xavier Henry, Andrew Wiggins and Cliff Alexander. Source: Wikipedia. Playing Field Promotions is a booking agent for motivational sports speakers and celebrities. If you would like to book Bill Self for a speaking engagement or personal appearance, contact Bill Self’s booking agent for appearance & speaker fees at 1.800.966.1380.